"If there were a war, I would see to it that you lose. I would raise up another champion, another hero, as I did Jeran the knight and Lisha the sorceress, Garin the pirate lord, and Fyora the Fair. And they would subdue you, as I did before." She doesn't need a fancy Paint Brush. First, let's look at the great benefits you get from making it into the Neopian Times. "I've always loved Draiks. 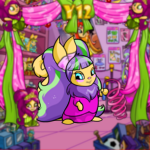 And the thing is, I've finally got a chance to adopt a Draik..."
Lilly rolled in her swivel chair away from her writing desk and groaned, throwing her pen onto her Neopian Times writing pad. She was fresh out of ideas. "Why should I tell you anything else? You cruel, heartless, evil neopet, you do not deserve to learn anything else from me."